...There seems almost a general wish of decrying the capacity and undervaluing the labour of the novelist, and of slighting the performances which have only genius, wit, and taste to recommend them....'And what are you reading. Miss ——?' 'Oh! it is only a novel!' replies the young lady; while she lays down her book with affected indifference, or momentary shame.— 'It is only Cecilia, or Camilla, or Belinda;' or, in short, only some work in which the greatest powers of the mind are displayed, in which the most thorough knowledge of human nature, the happiest delineation of its varieties, the liveliest effusions of wit and humour, are conveyed to the world in the best chosen language. In Northanger Abbey Jane Austen pays homage to the women writers who preceded her, and who created a literary marketplace in which women could publish, be read, and receive money for their efforts. Named in the passage quoted above are books by Fanny Burney and Maria Edgeworth; and the sensationalistic novels of Ann Radcliffe are avidly read by Northanger Abbey's highly impressionable heroine, Catherine Morland. 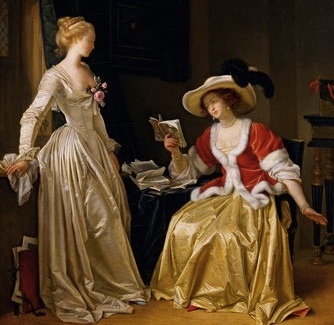 In this new market for literature, the number of books written by and chiefly aimed at women experienced rapid growth in the last decades of the eighteenth century. According to Julia Philips Stanton, the number of women writers increased by "around 50 percent every decade starting in the 1760s." However, as Jan Fergus notes, "the older aristocratic attitudes that saw print and payment as vulgar were surprisingly persistent among elite women and some men." 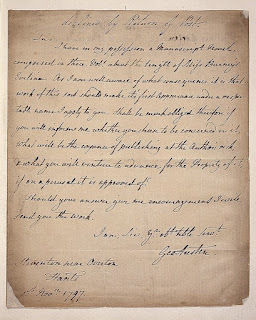 Because public notice and monetary exchange were involved, writing for the market was seen as disreputable for respectable women (and this attitude persisted well into the nineteenth century). Burney's Evelina (1778), Edgeworth's Castle Rackrent (1800), and Radcliffe's A Sicilian Romance (1790) were all first published anonymously. "People shall pay for their knowledge if I can make them"
Publishing on commission: Publishing on commission limited the financial risk to the publisher by shifting the responsibility for the costs of printing and advertising a work to the author. In practice, publishers often paid the production costs for a title up front, and repaid themselves from sales, plus a commission on every copy sold (typically 10 percent). If the edition did not sell enough copies to cover the production costs, the author wound up owing the publisher money. In a variation of publishing on commission called profit-sharing, publishers agreed to absorb any potential loss in exchange for a higher share of any potential profits (typically 50 percent after costs were covered). Sale of copyright: Outright sale of copyright was the least risky way for authors to see their books into print. Authors could be sure of their return on a book, and would generally receive the full amount within twelve months (rather than having to wait to receive payment if sales of the edition were slow, as they did on the commission system). If sale of copyright limited authors' financial exposure, though, it also limited their potential gain. Once a publisher had purchased the copyright, the publisher, not the author, received all of the income from sales. (Of course, the publisher also bore all the risk if an edition didn't sell.) And if the first edition sold well, the publisher had the right to issue subsequent editions without paying the author any additional fee. This is what happened with Pride and Prejudice. Austen sold the copyright to Egerton for £110 (she had wanted £150). In comparison to Sense and Sensibility, the first edition of Pride and Prejudice issued in January 1813 was larger (1,000 copies instead of 750), cost more (18 shillings instead of 15), and sold out in half the time (9 months instead of 18). Egerton issued a second edition in October 1813; on both editions, Fergus estimates that Egerton, after deducting production costs and Austen's copyright fee, may have realized a profit of more than £450. Austen herself never saw another penny from her most popular novel. Subscription: This was a publishing model that could work very well for established authors, but was more logistically troublesome than either publishing on commission or sale of copyright. When publishing by this method the author solicited subscribers by advertisement or direct appeal, asked them for payment in advance, and sent them copies of the finished work once it was published; each copy was bound with a printed list of the subscribers. Fanny Burney provides an example: after the success of Evelina and Cecilia, Burney cleared £1,000 by selling subscriptions to her third novel, Camilla. (She later sold the copyright for another £1,000.) 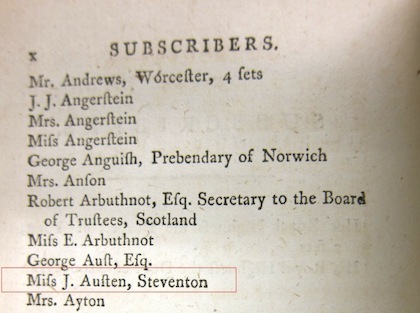 Among the list of subscribers to Camilla was "Miss J. Austen, Steventon." Although clearly familiar with subscription publishing, Austen did not attempt to publish any of her books by this method. Circulating libraries were a major market for novels, and over the course of Austen's life such libraries became increasingly popular. Circulating libraries charged a modest subscription fee in exchange for the right to borrow a small number of books at a time; they were a way for those with limited incomes—especially women—to have access to books, which were expensive luxuries. For authors, not only did this limit their financial risk when publishing on commission (since some level of sales was virtually guaranteed), it magnified their readership. Fewer than 2,000 copies of Pride and Prejudice were published during Austen's lifetime, but because each copy in a circulating library had multiple readers, it was read by many thousands more. Novel-reading was especially frowned on for women, who were seen as easily swayed and emotionally susceptible. In The Female Quixote (1752) Charlotte Lennox satirized this point of view, while also acknowledging the power of fiction to engage the imagination. Arabella, the heroine of The Female Quixote, reads French romances so addictively that she's come to see herself as one of her fictional heroines. As Jan Fergus details, after Egerton reaped large profits from the success of Pride and Prejudice, Austen decided to return to having her next book, Mansfield Park, published on commission. She was wise to do so. The first edition of 1,250 copies sold out in just six months, yielding her a profit of £310—the most she earned from any of her novels. She evidently wanted to risk a second edition, but Egerton may have advised against it. This may have been one reason that Austen decided to switch publishers. 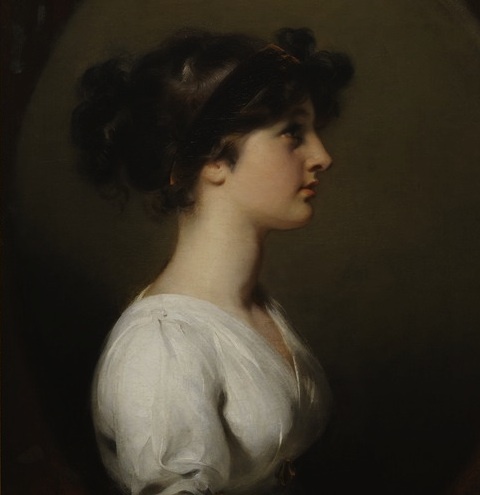 She sought to sell the copyright of her fourth novel, Emma, together with those of Mansfield Park and Sense and Sensibility, to the prestigious house of John Murray (the publisher of Byron and Walter Scott). His offer of £450 fell far short of her expectations, however, and she once again published the new book on commission. Emma was issued at the end of 1815 in an edition of 2000 copies, and a second edition of Mansfield Park was issued by Murray about two months later. Although Emma made a substantial profit, the second edition of Mansfield Park did not sell well; after covering Murray's losses on Mansfield Park, Austen realized less than £40 from the sales of Emma. Northanger Abbey and Persuasion were issued together in four volumes in an edition of 1,750 copies by Murray at the end of 1817. The novels sold well and ultimately realized a profit of more than £500. Alas, Jane Austen did not live to see their success. It was Cassandra and Henry who saw these last works through publication. Jane passed away in July 1817, after months of debilitating illness. However, between September 1815 and August 1816 she marshalled her energies to produce what is, in my view, her greatest achievement: Persuasion. Alvin Kernan, Printing Technology, Letters & Samuel Johnson, Princeton University Press, 1987, p. 4. Quoted in Jan Fergus, "The professional writer," in Edward Copeland and Juliet McMaster, eds. The Cambridge Companion to Jane Austen, Second Edition. Cambridge University Press, 2011, p. 2-3. Judith Phillips Stanton: "Profile of Women Writing in English from 1660 to 1800," in Frederick M. Keener and Susan E. Lorsch, eds. Eighteenth-Century Women and the Arts, Greenwood Press, 1988, p. 248. Quoted in Fergus, "The professional writer," p. 2. Emphasis in the original. Jane Austen, Mansfield Park, Volume III, Chapter ix; Chapter 40. Jane Austen, Pride and Prejudice, I. xiv. ; 14. Jane Austen, letter to Cassandra Austen, 18 December 1798. From R. W. Chapman, ed., Jane Austen's letters to her sister Cassandra and others, Oxford University Press, 1932, pp. 38-39. Jane Austen, Northanger Abbey, I. xiv. ; 14. Northanger Abbey, II. vi. ; 21. Northanger Abbey, II. ix. ; 24.